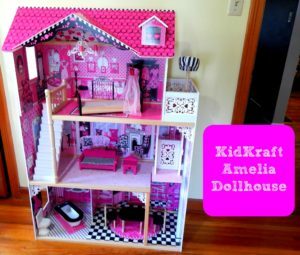 If you are looking for that perfect dollhouse, I highly recommend the KidKraft Amelia Dollhouse. When I was a little girl, I always dreamed of having a dollhouse like this. I always used a cardboard box and pretend it was my dream dollhouse. I can only imagine how much fun I would have had with a real dollhouse like this! When Kaylyn was 5 we knew we wanted to get her a dollhouse. She was reaching that age when she was really interested in dolls and figured she would love her very own dollhouse. So we searched all over the internet. We knew we wanted a house that would fit regular sized dolls, not miniatures. 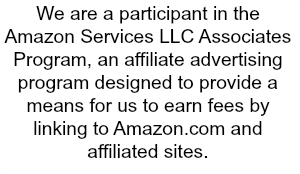 We also knew that we wanted something that was easy to assemble and had accessories. 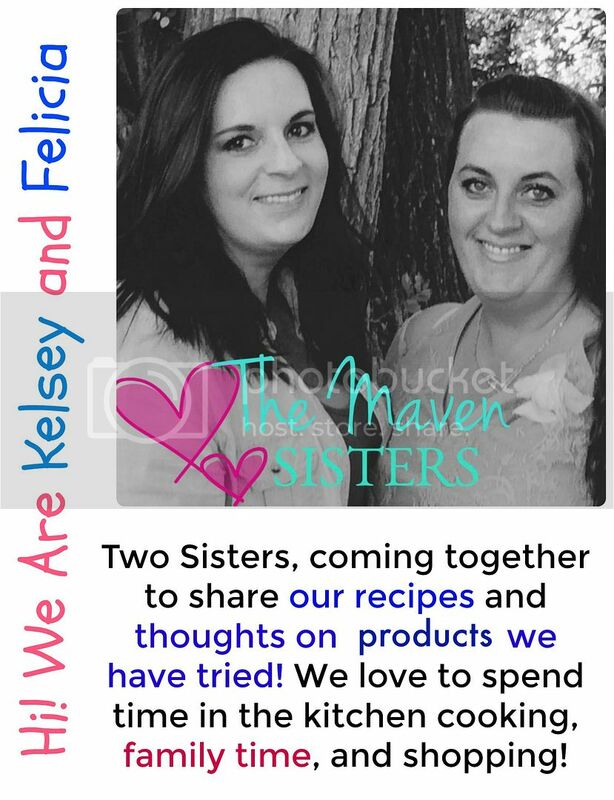 Most importantly we didn’t want to break the bank. The KidKraft Amelia Dollhouse had everything we were looking for. The assembly took around an hour, it comes with 15 pieces of furniture and isn’t very expensive. 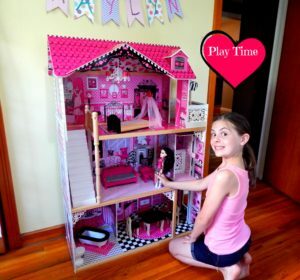 Kaylyn is now 9 and still loves to play with her dollhouse. I am sure with her getting older we only have a few more years that she is going to want to play. However, Haydyn isn’t even 2 so we know that she will get many years of entertainment out of it as well! One of the things I really like about the KidKraft Amelia Dollhouse is that it has such nice graphics on it and it encourages creative playing. Your dolls can rearrange their furniture, take a ride on the elevator or take a nap in the adorable bed! I promise your kiddo’s won’t get bored playing with this dollhouse. Plus, if you dreamed of having your own awesome dollhouse when you were little, you can even enjoy some playtime yourself (with the kids of course).